Altitude locks do not work. 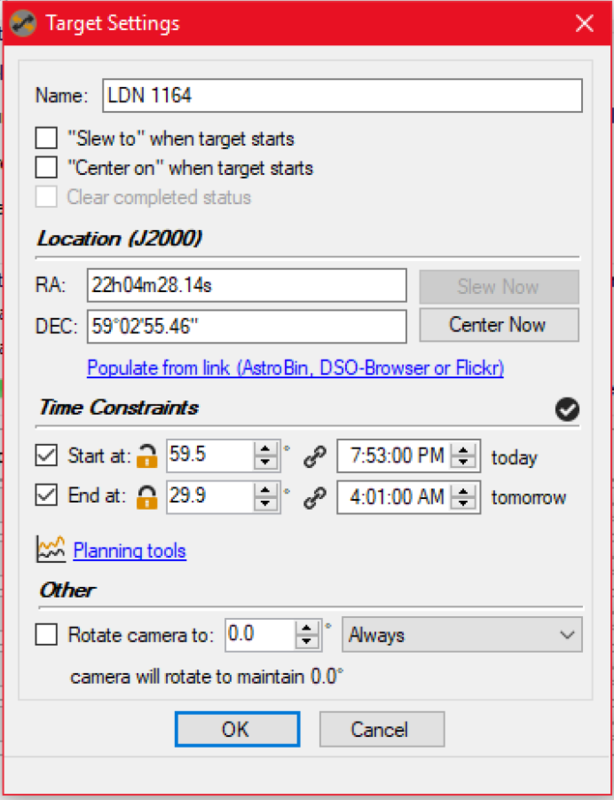 The help file suggests that enabling the “lock” in planning tools will lock the altitude setting for start/end times, thus prompting the session to start at the same altitude, regardless of time, each time the sequence runs. If you want to end when a target is at a certain altitude, regardless of time, click the lock next to the altitude control. When this is locked, it means altitude will not vary but the start or end time will. 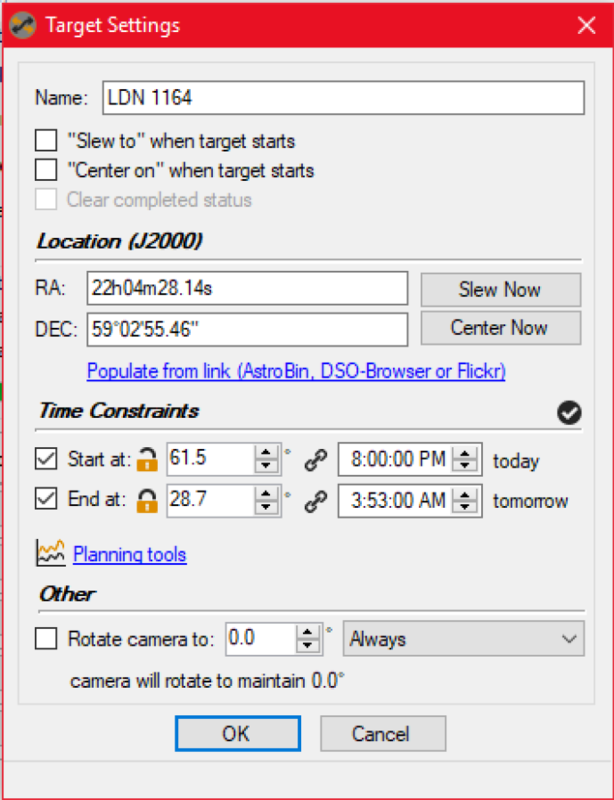 Note that both the altitude and time change each night for “End At”, despite the lock being closed. Today I discovered another issue, in configuring a new session for a mosaic of Sh2-190. The planning tools incorrectly report target altitude, despite the altitude being correctly shown in the “graph”. For grins, I rocked the hour back and forth a bit. At 2:40am, the altitude was correctly reported, however at 3:40 am and later, the -90.0 re-appeared. I am having the same issue. Were you ever able to get this resolved? I also noticed the same problem. 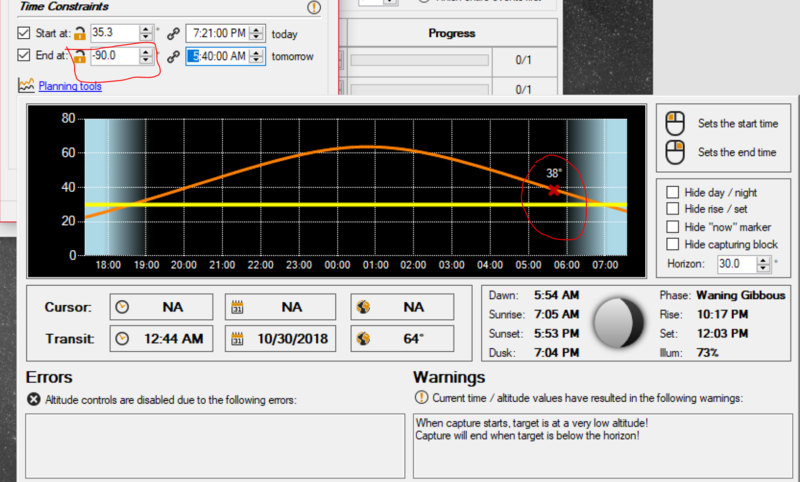 At some point I thought this was due to the fact that the altitude control is rounded up to 0.1 degrees accuracy in the form, which might cause some variance in the day to day timing. But I never could confirm this. So I end up checking and adjusting the start and end times every night, although it should not be required in principle with locked altitudes. I would also be interested in hearing solutions or comments on this “issue”!